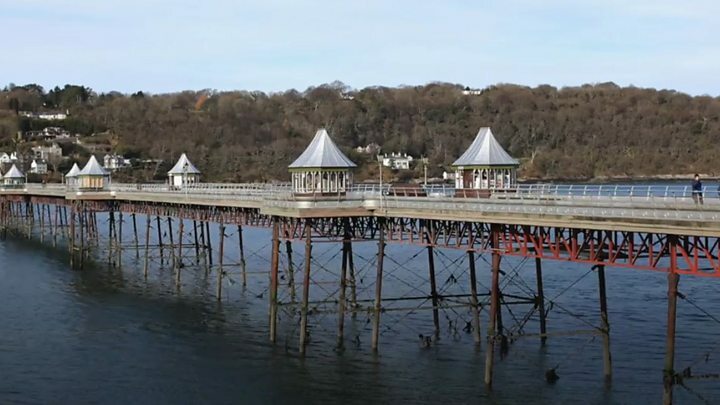 A bid to restore one of Wales' oldest Victorian piers is £600,000 short of the total needed after cash ran out. Repairs have been ongoing at Garth Pier for two years, paid for using £1.3m of Bangor City Council's reserves. Unforeseen work on the pier means the extra cash is needed in order to finish the job. Bangor mayor John Wyn Jones said: "There's nothing that's not in our minds... We're even thinking about crowdfunding." The extra £600,000 is required after damage was discovered at the furthest end of the 1,500ft-long (470m) pier, which was closed at short notice in June after engineers deemed it "a danger to the public". The cost to repair this was not factored into the original costs, so the council is considering options including bidding for Heritage Lottery funding or asking either historical monuments body Cadw or the Welsh Government to step in. Mr Jones said ratepayers had footed their share of the bill over the years, so did not want to impose any charges on people in the city. But, he added, there were "lots of people who love the pier and we hope that they love it so much they'd be able to put their hands in their pockets". Where is the best pier in Britain? Scaffolding is still up on the end of the pier and it would be very costly to take it down and rebuild it at a later stage, a cost the council is keen to avoid. The closure also hit the former owners of Tea Room Pavilion, at the end of the pier, who said the closure left them "destitute". It is hoped work will be finished on the end of the pier - and a new tenant found for the cafe - in time for it to full reopen by the summer. Garth councillor Huw Wyn Jones said: "You only need to look at Colwyn just up the coast, 25 miles away, where maintenance wasn't done and it fell into the sea. "Unfortunately that's what happens with piers if you don't maintain them - for me, that makes it even more important that we look after this one and make sure it's here for generations to enjoy in future."